Discover the wonders of both the Fox and Franz Josef Glaciers in one scenic flight with the advantage of seeing more high peaks and a fantastic overview of the Southern Alps. Soar across pinnacles and crevasses and witness the deep blue ice of glacier country. 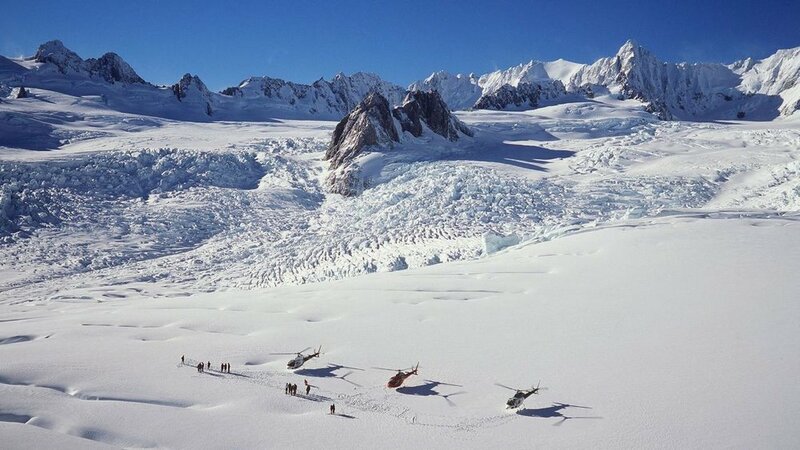 When the weather is right you may have the opportunity to cross over the ridge separating the two glaciers – an absolutely jaw-dropping moment in a helicopter. Take advantage of the terrific photo opportunities of Aoraki/Mt Cook (New Zealand’s highest mountain) and Mt Tasman while landed on the snow. Please note: snow landings are subject to weather conditions and are at the pilot’s discretion.